Michigan has so many state parks, state recreation areas, and state trails that no matter where you go in the state you’re never more than half an hour away from one. There are more than 13,500 campsites in more than 140 campgrounds, and almost 900 miles of trails. We’ve already featured the Michigan Bucket List: Waterfalls and the Michigan Bucket List: Lighthouses, and today we turn our attention to Michigan State Parks. We’ve had the privilege of visiting almost all of the state’s parks and have also camped in quite a few of them. 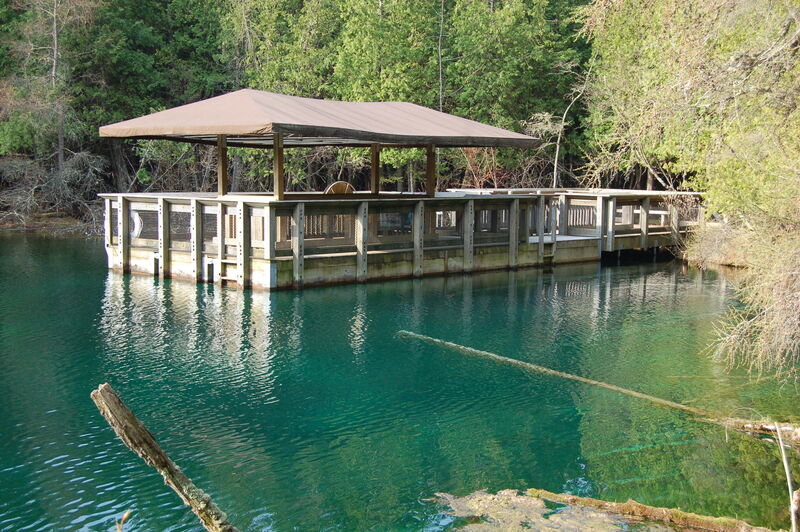 This list is made up of the 25 Michigan state parks we feel you absolutely have to see. 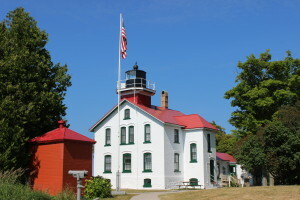 Many of these state parks border Lake Michigan, Lake Huron, or Lake Superior while others feature important historical sites, lighthouse, waterfalls and more. Our list runs the full range from wilderness hiking and rustic camping to busy beaches and campgrounds with a full array of modern amenities. We hope you enjoy our Michigan Bucket List: State Parks, and take advantage of the warm summer months by getting out and exploring a few new ones. A Michigan recreation passport is required for entry to these parks, but at $11 per year this remains one of the best values in the entire country. 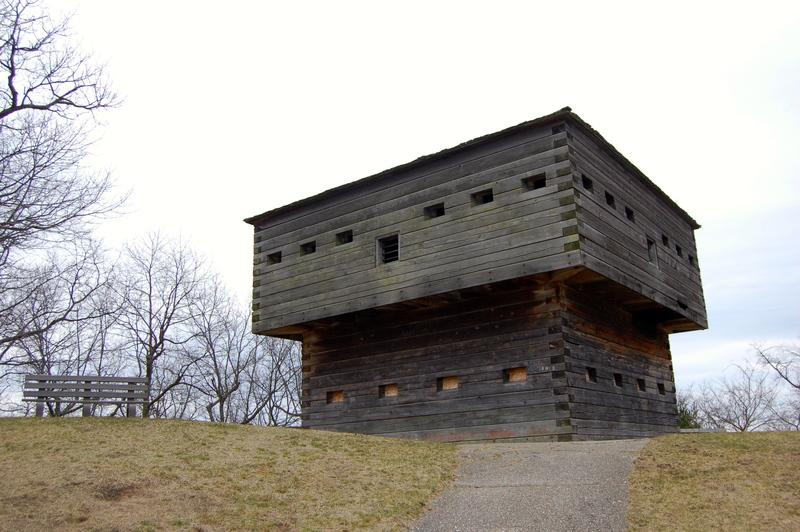 Fayette Historic State Park – History buffs will love checking out the many restored buildings at Fayette Historic State Park. This small town was once an industrial community that manufactured pig iron, and it now offers visitors a chance to step back in time to the 19th century. You can tour the town from May to October, explore five miles of hiking trails, and take in the scenic views of Snail Shell Harbor and the towering limestone cliffs. A semi-modern campsite offers 61 sites. You can check out our Photo Gallery Friday: Fayette Historic State Park post for more pictures, and find out more information on the park at: www.michigandnr.com. From US-2 west of Manistique, take M-183 south for 16 miles until you reach the park entrance. Straits State Park – One of the Upper Peninsula’s most popular parks, Straits State Park can be found in St. Ignace at the north end of the Mackinac Bridge. There are 270 camp sites, including some on the Lake Huron waterfront. 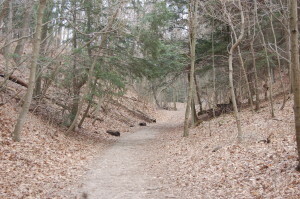 The park also has a mile-long hiking trail, bridge viewing areas, and a playground. 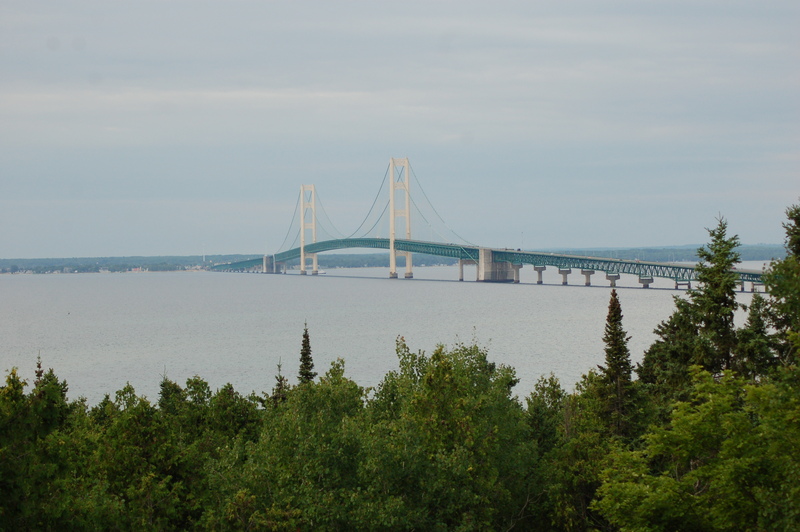 It is a short drive to downtown St. Ignace and the Mackinac Island ferry docks. We’ve often made Straits State Park our base camp for Upper Peninsula adventures. 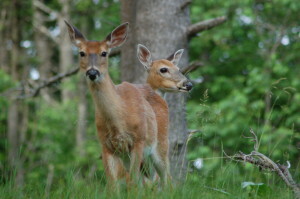 Check out our 10 Things To Do In St. Ignace post for more ideas, and find additional state park information at: www.michigandnr.com. 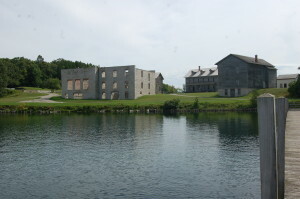 Straits State Park also manages the Father Jacques Marquette National Memorial on the other side of I-75. Holland State Park - Consistently one of Michigan’s most visited state parks, Holland State Park features a sandy beach on Lake Michigan, two campgrounds, and views of the Holland Harbor Lighthouse and the Mt. Pisgah sand dune. There are more than 300 campsites here, and plenty to do in the surrounding area. More information at michigandnr.com. 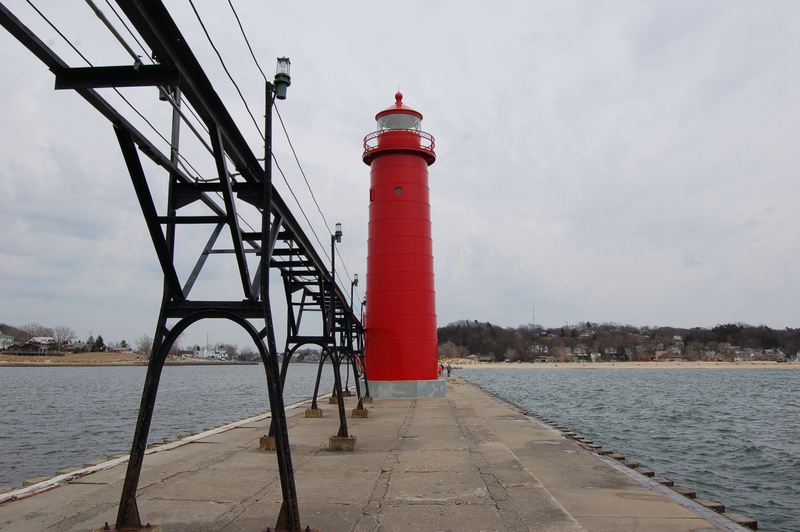 Muskegon State Park - Two large campgrounds and beaches on both Lake Michigan and Muskegon Lake are the main draws to Muskegon State Park. In the winter visitors can enjoy cross-country skiing, ice skating, and a luge run where an Olympian has trained. More than 10 miles of trails wind over dunes and through forests, and Snug Harbor has a boat launch and picnic area. Check out our Photo Gallery Friday: Muskegon State Park for pictures of this park, and we’ve also provided a list of 16 Things To See and Do in Muskegon. 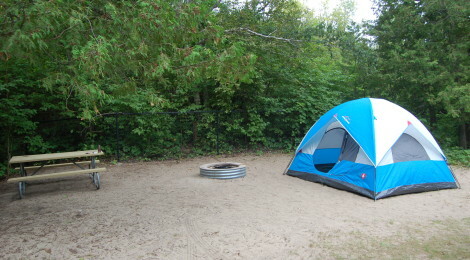 The two campsites feature more than 240 sites, more info at michigandnr.com. 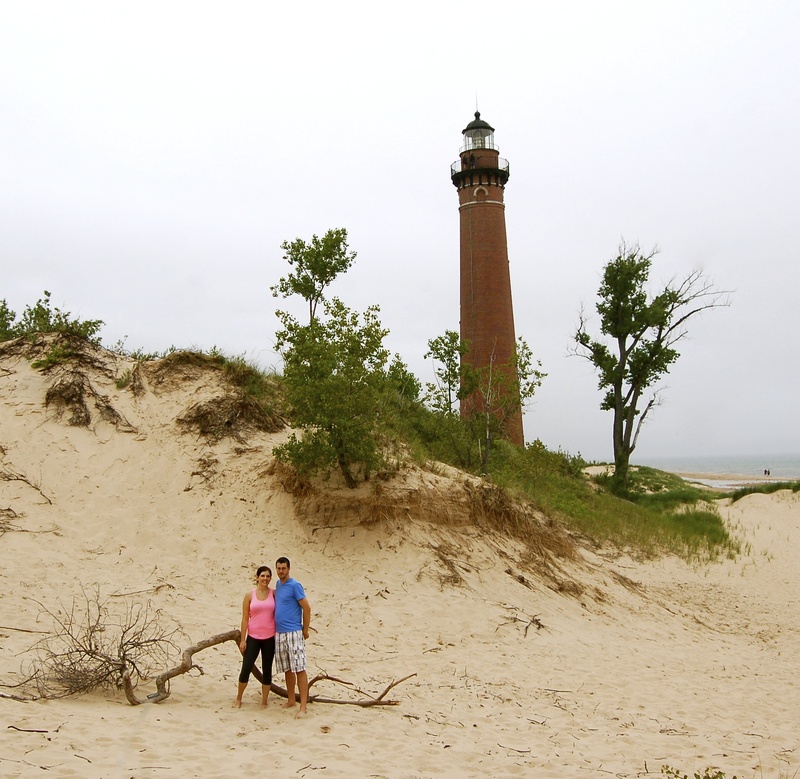 Silver Lake State Park – With more than four miles of Lake Michigan beach and miles of dunes to explore, it’s no wonder visitors flock back to Silver Lake State Park each year. The park features an ORV area for private vehicles, Mac Woods Dune Rides, and a historic lighthouse. 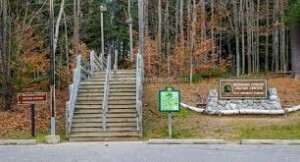 The campground has 200 sites, with more information available at michigandnr.com. 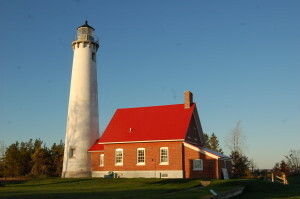 You can also check out our post about the Little Sable Point Light (pictured above) for more information on tours. Petoskey State Park – There are plenty of things to do in the Petoskey area, which features an amazing wine and craft beer scene, downtown shopping opportunities, and plenty of arts and entertainment. The best camping option is Petoskey State Park – a 300 acre paradise that features a swimming beach on Lake Michigan, sand dunes, and the chance to hunt for Michigan’s state stone. The campground offers 180 sites in two sections, and there are more than two miles of trails running through the park. 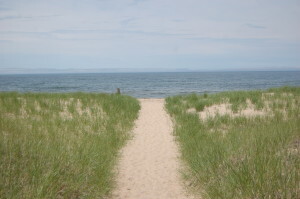 Check out our Photo Gallery Friday: Petoskey State Park or michigandnr.com for more information. 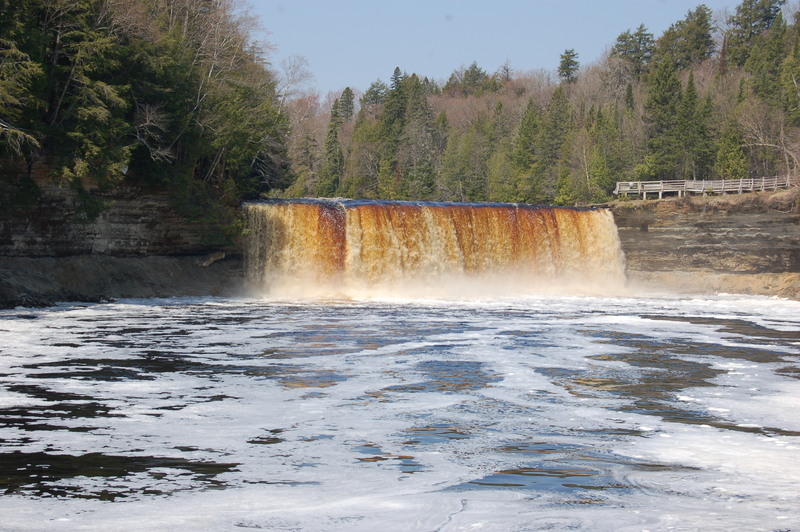 Tahquamenon Falls State Park - Michigan’s second largest state park (46,000 + acres) is highlighted by the Upper Tahquamenon Falls, the second largest waterfall (by volume) east of the Mississippi River. The Lower Falls is a set of drops around an island in the river, and you can visit the island by renting a rowboat during the summer months. Five campgrounds combine to offer 350 sites, and there are more than 20 miles of trails to explore. Enjoy our Photo Galley Friday: Tahquamenon Falls State Park for views in the spring, summer and fall months and find campground info at michigandnr.com. Porcupine Mountains Wilderness State Park – Michigan’s largest state parks has long been a favorite of Midwesterners looking for a more intense outdoors experience, but it has recently started to get national attention as well. 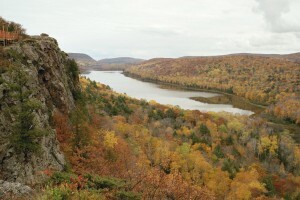 Porcupine Mountains Wilderness State Park finished as the runner-up in last year’s 10best.com Reader’s Choice Awards poll for best state park in the country, with voters praising its waterfalls, hiking trails, scenic mountain vistas, mining history, and unspoiled wilderness. There are more than 200 campsite options ranging from backcountry camping to modern sites on Union Bay, and nearly 90 miles of hiking trails of varying degrees of difficulty. Favorite spots include Lake of the Clouds, the waterfalls of the Presque Isle River, the Union Mine Trail, Greenstone and Overlooked Falls, the Escarpment Trail, and the beach along Lake Superior. More details at michigandnr.com. Indian Lake State Park/Palms Book State Park - Two campgrounds offer different experiences on opposite sides of Indian Lake (the Upper Peninsula’s fourth largest inland lake), with 145 modern sites in the south unit and 72 semi-modern sites in the west unit. There are two miles of trails and great opportunities for swimming, boating, and fishing. Indian Lake State Park also operates the Palms Book State Park day use area, which is highlighted by the “Big Spring Kitch-iti-kipi.” A self-propelled wooden raft takes visitors out on a pond where a spring keeps the water a constant 45 degrees and clear enough to see the large fish that gather at the bottom. You can see more from Palms Book in our Photo Gallery Friday: Big Spring Kitch-iti-kipi post, or head to michigandnr.com for camping information at Indian Lake State Park. 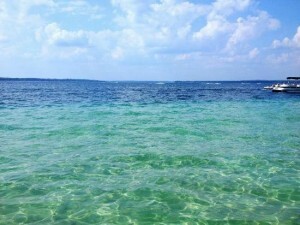 Cheboygan State Park – Amazing views of Lake Huron and swimming and fishing opportunities are a few of the things that draw visitors to Cheboygan State Park. There’s also a 76 site campground, three cabins for rent, and more than five miles of trails that wind through the park and pass the ruins of the Cheboygan Point Lighthouse (built in the 1850s). Be sure to stop into town and check our Cheboygan Brewing Company and the Cheboygan Crib Light. More info at michigandnr.com. 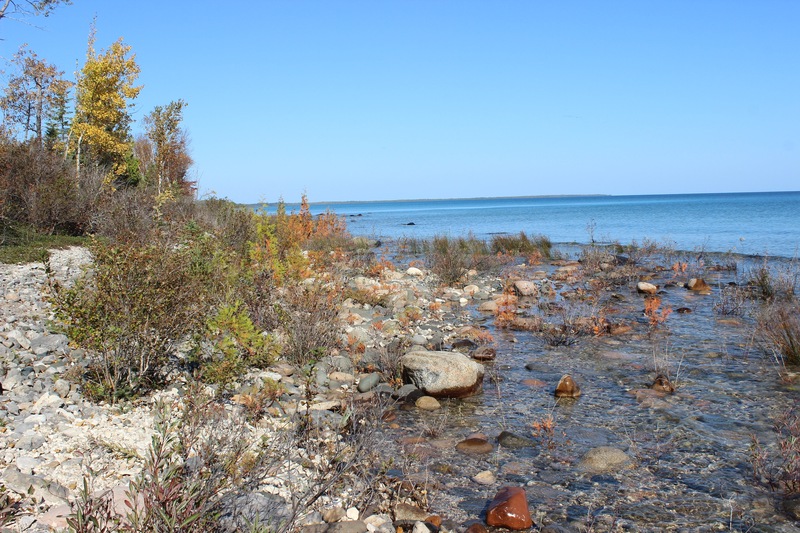 Rockport State Park – North of Alpena on the shores of Lake Huron lies Rockport State Park, home to a protected harbor, a former limestone quarry, nature trails, sinkholes, and the Besser Natural Area. It tends to be much quieter and less busy at this park than others along the Huron shore. Find out more at michigandnr.com. Tawas Point State Park - A state park that is referred to as the “Cape Cod of the Midwest” has to be a great spot for a summer vacation, right? Tawas Point State Park is located on a sand spit that juts into Lake Huron, and the campground is located on Tawas Bay where the sandy beach offers warmer temperatures for swimming. Visitors also love checking out the Victorian-era style Tawas Point Lighthouse, which was built in the 1850s and is open for tours at select times. Find out more at michigandnr.com. Warren Dunes State Park - One of the states most popular parks, Warren Dunes sees thousands of visitors during the summer who come to check out the large, sandy beach and the towering sand dunes. Tower Hill, Pike’s Peak, Mt. Fuller, Mt. Randal and Mt. 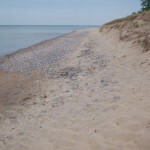 Edwards are a few of the named dunes rising up to 240 feet above Lake Michigan. The campground has more than 180 modern sites and 36 semi-modern sites, and six miles of nature trails take visitors to the top of a dune and alongside a scenic creek. Check out our Photo Gallery Friday: Warren Dunes State Park post for more pictures, and visit michigandnr.com for more information. Algonac State Park – The biggest draw is watching freighters (especially international ones) travel up and down the St. Clair River, but visitors will also find nearly 300 campsites and four miles of hiking trails. 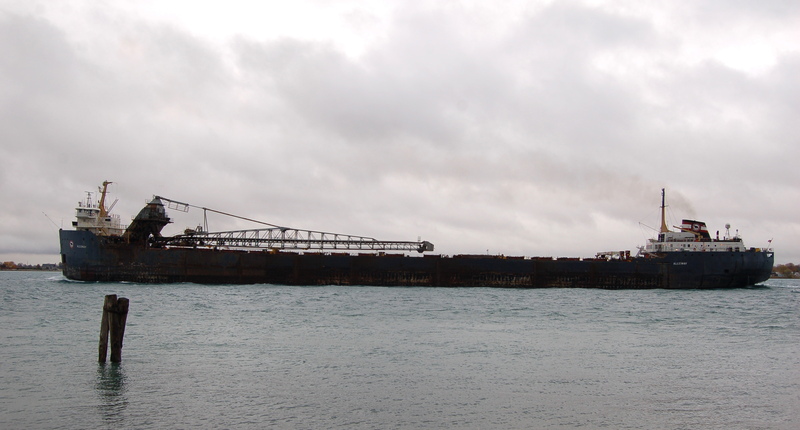 All vessels headed to Lake Huron, Lake Michigan, or Lake Superior from the St. Lawrence Seaway must pass by this point. The park also features rare lake plain prairie and oak savanna habitats, as well as several endangered plant and animal species. Find out more at michigandnr.com. Belle Isle Park – This beautiful park owned by the city of Detroit became a state park in 2014, with millions in upgrades scheduled for the next few years. There’s something for everyone here including a lighthouse, museum, aquarium, nature zoo, stunning architecture, a beach, a large marble fountain and more. 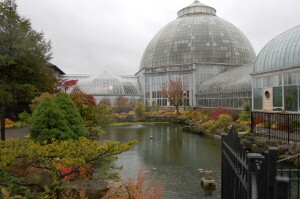 Check out our 12 Things To See and Do at Belle Isle Park for more ideas, and visit michigandnr.com for maps and more information. 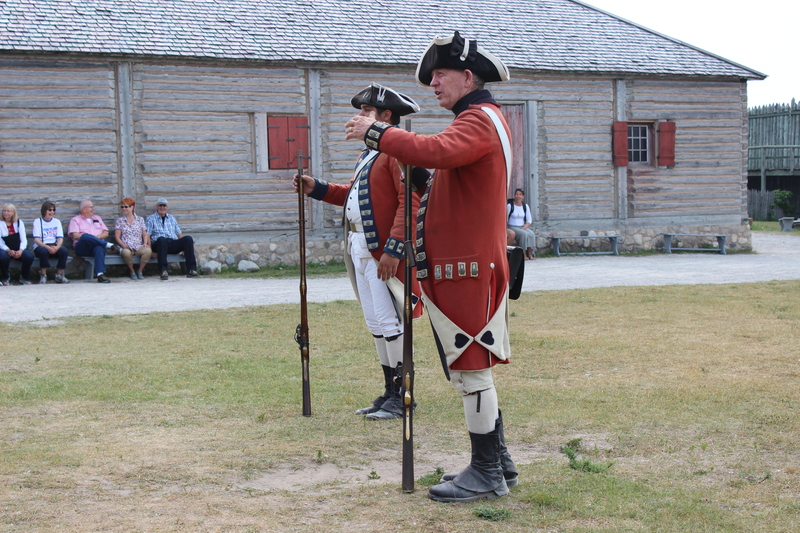 Mackinac State Historic Parks – A collection of six parks in the Mackinaw City area are managed together as the Mackinac State Historic Parks, offering a variety of family friendly fun. 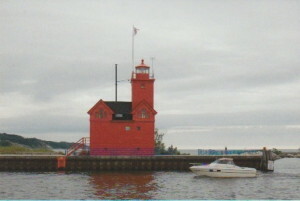 The Old Mackinac Point Lighthouse is an 1889 castle-like structure that is open for tours and tower climbs, Colonial Michlimackinac is a restored 18th century fort and fur-trading village that features costumed interpreters, and Historic Mill Creek Discovery Park features a restored historic sawmill and a zipline. 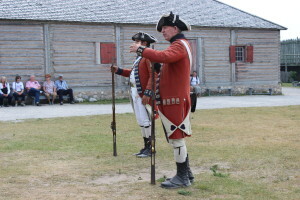 On Mackinac Island (check out our 12 Things To Do On Mackinac Island) the MSHP oversees Mackinac Island State Park (which covers nearly 2/3 of the island), the Richard and Jane Manoogian Art Musuem, and Fort Mackinac – a former British and American outpost with history dating back to the Revolutionary War. 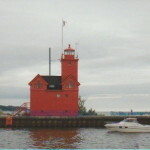 Find out more about the hours and admission fees of these sites at: http://www.mackinacparks.com/. 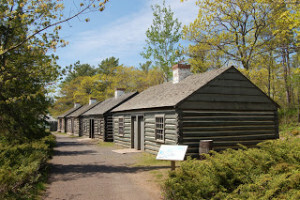 Fort Wilkins State Park – When the copper rush hit the Keweenaw Peninsula in the 1800s, a fort was built in Copper Harbor to host U.S. Army troops sent there to keep the peace between miners and local Native American tribes. Highlights of visiting Fort Wilkins State Park include touring the restored fort and visiting the Copper Harbor Lighthouse (built in 1848). 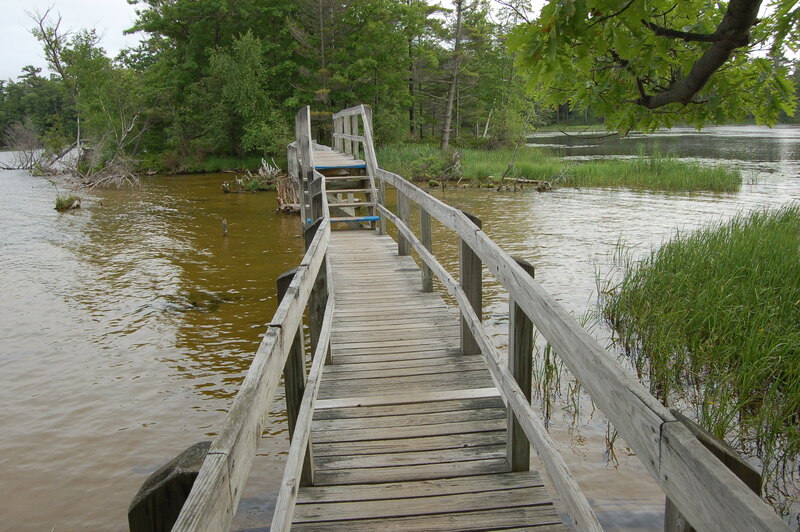 The campground has 159 sites and there is a four mile foot trail passes Lake Fanny Hooe and several scenic overlooks. Find out more at michigandnr.com. 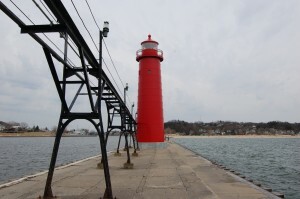 Grand Haven State Park – The beach at Grand Haven State Park is clean and sandy and the Lake Michigan water is warm and ideal for swimming, which makes this one of West Michigan’s most popular summer destinations. The Grand Haven South Pier Lighthouse marks the point where the Grand River meets the lake and is a favorite spot for an afternoon or evening stroll. 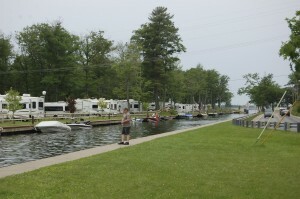 The campground has 174 sites, all with modern amenities. Find out more at michigandnr.com. Hartwick Pines State Park – The third largest state park in the Lower Peninsula, Hartwick Pines State Park features and old growth pine forest, two lakes, a logging museum, hiking trails, a campground, and more. The park shows a balance of preserving the majestic pines that once covered most of the state while also honoring the logging industry’s history and economic importance. The campground has 100 modern sites, and there are more than 20 miles of trails within the park’s boundaries. Hartwick Pines is also home to the Michigan Forest Visitor Center, which has many displays and interactive programs. Find out more at michigandnr.com. Hoffmaster State Park – This gem of a state park can be found north of Grand haven and south of Muskegon along the Lake Michigan shoreline, and in summer months you’ll often find its beach a little less crowded than those other parks. Named for P.J. Hoffmaster, considered the father of Michigan’s state park system, Hoffmaster State Park is full of scenic landscapes and presents many opportunities for wildlife watching Hiking highlights include the three mile long Homestead Trail, the one mile trail that leads to a sand dune overlook, and the wooded “Walk-A-Mile” trail. The Gillette Sand Dune Visitor Center has exhibits on dune ecology, live animal exhibits, and frequent interpretive programs. 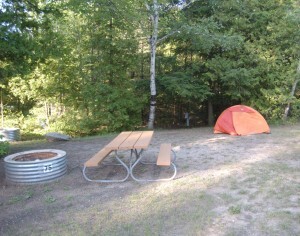 The campground has nearly 300 modern sites, while the day use area has picnic areas, trail access, and a spacious beach. More details available at michigandnr.com. Leelanau State Park – What could be better for a summer week/weekend escape than visiting a state park at the tip of a peninsula known for its wineries and scenic beauty? 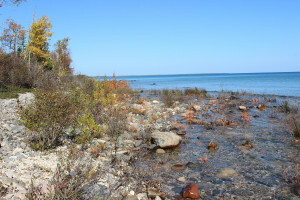 Leelanau State Park has a rustic campground with more than 50 sites, the Grand Traverse Lighthouse Museum, and more than eight miles of trails. The warmer water in the bay makes for great opportunities for swimming and kayaking. Find out more at michigandnr.com. 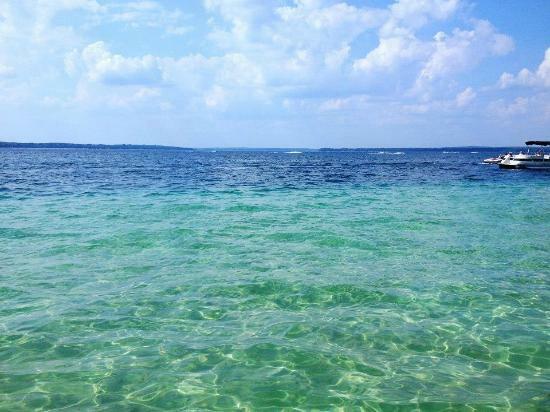 South Higgins Lake State Park – With a mile of shoreline on the clear, spring-fed waters of Higgins Lake, this state park offers amazing boating, fishing, and swimming opportunities. 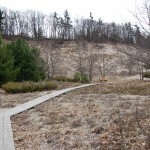 South Higgins Lake State Park also has frontage on Mari Lake and more than 10 miles of hiking trails. 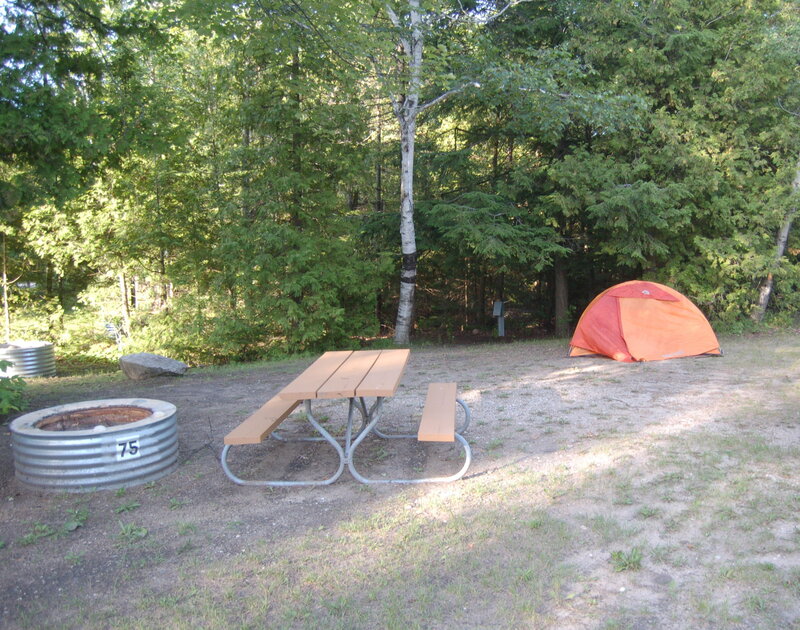 Its 400 site campground is one of the largest in the state and it offers modern amenities. Find out more information at michigandnr.com. 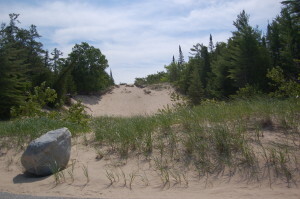 Ludington State Park – The DNR describes Ludington State Park as “nearly 5,300 acres of scenic sand dunes, shoreline vista, ponds, marshlands and forests. 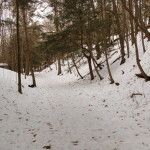 It is situated between Hamlin Lake and Lake Michigan with several miles of shoreline and beaches on both bodies of water.” The park also has more than 20 miles of hiking trails, two miles of bicycle trails, a canoe trail, and 10 miles of cross country skiing trails. Three campgrounds combine to offer more than 350 sites, and the historic Big Sable Lighthouse can be reached by a short hike from the campground or by following the shoreline to the north. Fishing opportunities are present on Hamlin Lake and on the Au Sable River, while a day use area features a stunning Lake Michigan beach that seems to go on for miles. 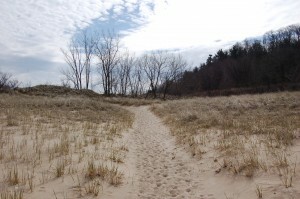 You can check out our Photo Gallery Friday: Ludington State Park post to see some of the great sights from this park, and find out more about camping at michigandnr.com. 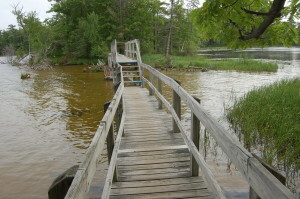 Mitchell State Park – This popular Northern Michigan park is located between Lake Mitchell and Lake Cadillac and some sites even back up to the canal connecting the two bodies of water. The campground features more than 220 sites (all modern) and a 2.5 mile nature trails winds through the park. Water sports and fishing are popular on both lakes, and the park’s day use area on Lake Mitchell has a sandy swimming beach and picnic areas. The Carl T. Johnson Hunting and Fishing Center at the park is open year-round and features exhibits of local wildlife as well as details of the history of hunting and fishing in Michigan. Find more information at michigandnr.com. Saugatuck Dunes State Park – You won’t find a campground at Saugatuck Dunes State Park, but it is hands down one of the top day-use facilities in the state. 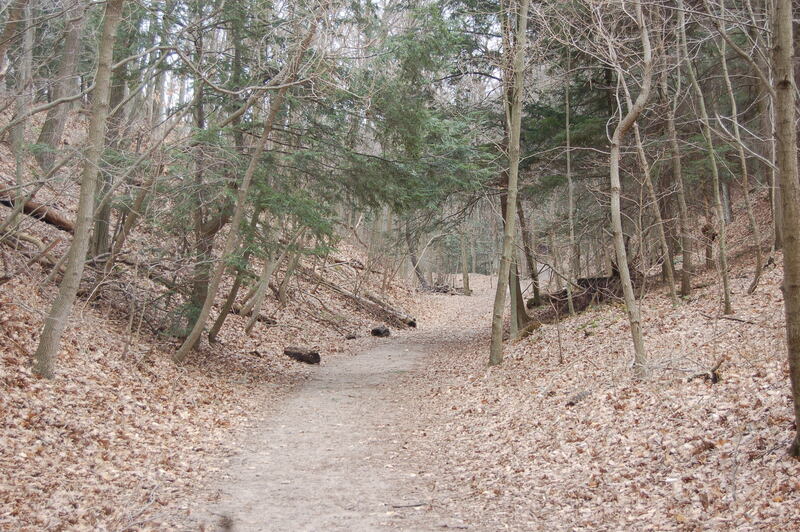 The park offers 14 miles of hiking trails (varying difficulty), including the one mile long path to the beach. Those who make the trek to Lake Michigan are rewarded with two miles of beach, and fewer crowds than parks to the north and south. Some of the dunes here reach 200 feet above the lake, and while this park is less developed than others that remains as part of its charm. Check out our Photo Gallery Friday: Winter at Saugatuck Dunes State Park post for more pictures, and find out more at michigandnr.com.